Within a single Avi GSLB configuration, a set of identical services running at multiple sites can be formed into a GSLB service. This article shows the steps to take to perform the configuration. You must login as a user who has write access to GSLB Services, as shown in GSLB section of this display of the Tenant-Admin role. Navigate to Applications > GSLB Services as shown below. Click on the green Create button, and select the Basic Setup option. Application Name – This field concatenated with the Subdomain forms the FQDN of the application. Subdomain – This field's pulldown menu is prepopulated with the subdomains associated with the GSLB configuration. Add or subtract to the set by navigating to Infrastructure > GSLB > Site Configuration. Note: When first entered, a subdomain should take the form alpha.beta.com. When it appears in the pulldown Avi Vantage automatically prefixes it with a dot. Health Monitor – If it is desired to have the DNS Service Engine generate synthetic traffic via which to mark a service up or down, this field specifies which monitor to use. Five are included by default and automatically appear in the pulldown list: System-GSLB-UDP, System-GSLB-HTTPS, System-GLSB-HTTP, System-GSLB-TCP and System-GSLB-Ping. The pulldown list includes a green Create option via which to define yet another monitor. Alternatively, navigate to Templates > Profiles > Health Monitors to define a custom monitor for use with the global application. 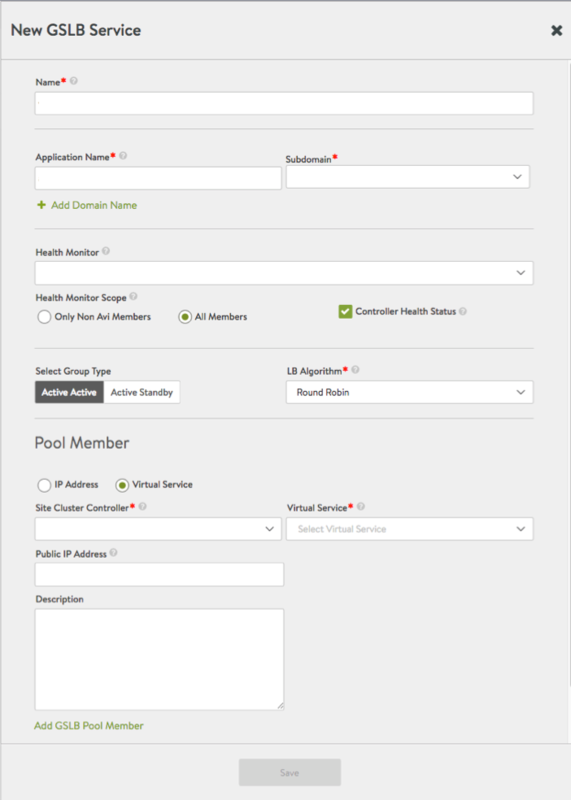 Health Monitor Scope – By default, health monitors will assess the health of all GSLB pool members, be they Avi virtual services or external (third-party) VIPs. Choose Only Non Avi Members if you believe data-path monitoring of Avi members is redundant to the control-path health monitoring that may be in play. Controller Health Status – The default is to assess the health of Avi member services by collecting VS health status from their local Avi Controllers. This option is irrelevant to external VIPs, whose health can only be assessed via data-path health checks. 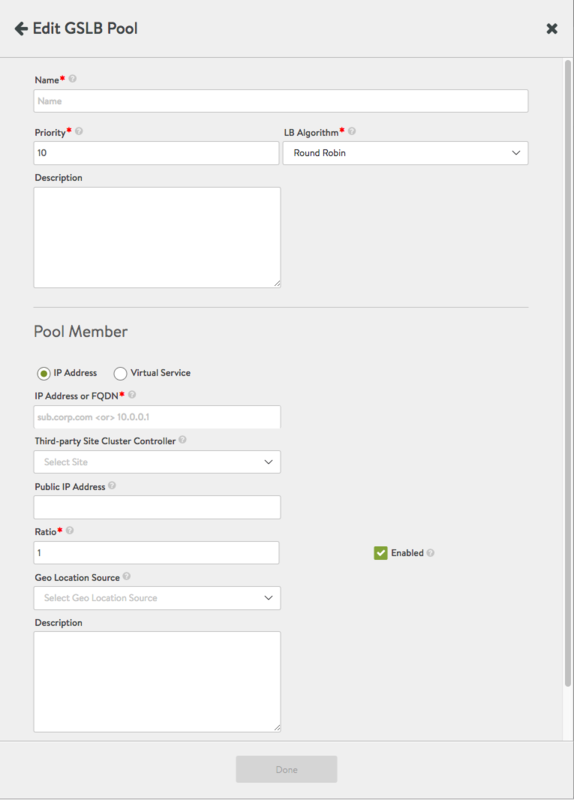 Select Group Type – Select the behavior for pools. Only if the default (Active Active) is chosen may you select one of three load balancing algorithms. LB Algorithm – For Active Active pool configurations, choose either round-robin (the default), consistent hash, or geo. IP Address/Virtual Service – Choose IP Address to identify an external (third-party) GSLB pool member. Accept Virtual Service (the default) to identify a native Avi Vantage virtual service. If IP Address is clicked ON, a different set of options appear; these are explained in the list of steps following this list. Site Cluster Controller – To identify a native Avi VS, it is first required to select its Controller via this field. The Controller must be pre-configured for its name to be present in the pulldown list. Virtual Service – This field only appears after a Site Cluster Controller has been chosen. Select a pre-configured VS from the pulldown list. Public IP Address – This is an alternative IP address for the pool member. In usual deployments, the VIP in the virtual service is a private IP address; it gets configured in the IP field of the GSLB service. In this field you can identify the public IP address for the VIP; it will get NATed to the private IP by a firewall. Client DNS requests coming in from within the intranet should have the private IP served in the A record, while requests from outside should be served the public IP address. Description – Insert into this free-form field whatever comments you like. Add GSLB Pool Member – After the first (minimum required) member service has been defined for the GSLB pool, click this hyperlink to create an additional one. If IP Address is selected at step 9 above to identify an external pool member, the below alternative display will appear. Follow the below steps instead of 10-14 shown above. Third-party Site Cluster Controller – From the pulldown, select the third-party site name to which the third-party VIP is to be associated. Public IP Address – This is an alternative IP address for the pool member. In usual deployments, the VIP of the third-party service is a private IP address; it gets configured in the IP field of the GSLB service. In this field you can identify the public IP address for the VIP; it will get NATed to the private IP by a firewall. Client DNS requests coming in from within the intranet should have the private IP served in the A record, while requests from outside should be served the public IP address. Familiarize yourself with the parameters which can be set in the basic setup, as outlined above. Then read this section, which highlights the additional parameters exposed via the advanced setup editor. Click on the green Create button, and select the Advanced Setup option. Notice the Pool Member section of the basic setup editor has been replaced by the GSLB pool section. Clicking the pencil icon opens the below window, which exposes additional options not available in the Basic Setup editor. Priority – The DNS service chooses the pool with the highest priority that is operationally up. Normally, this is a number between 1 and 100. Ratio – Overrides the default ratio of 1. It reduces the percentage the load-balancing algorithm would pick the GSLB pool member in relation to its peers. The value ranges between 1 and 20. Geo Location Source – Specify the geo location source or set the User Configured option from the pulldown to enter data about a particular location. Refer to Geolocation-based Load Balancing Algorithm for GSLB Members for more details. The fields to supply if defining a location on the fly are shown below. Number of IPs returned by DNS Service – If 0, then all IP addresses are returned; otherwise, one may specify a count between 1 and 20. 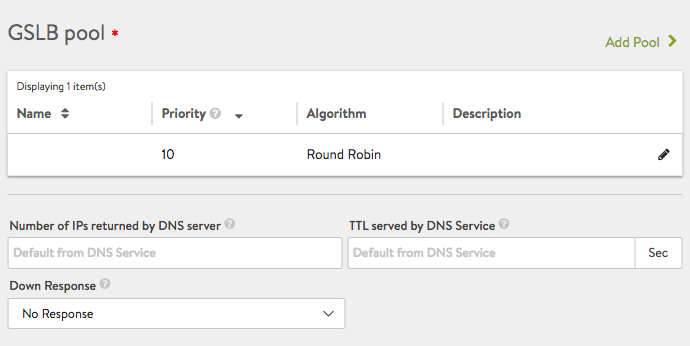 TTL served by DNS service – If the default from the DNS service is not suitable, a value between 1 and 86400 seconds may be chosen for all DNS records served on behalf of all GSLB pool members. Down Response – When the service is down, this field will govern the response from the DNS. One may choose no response, an empty response, a fallback IP, or a response containing all records.